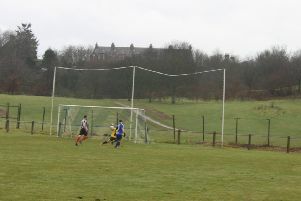 Stonehaven welcomed West Region Central District Division One side St Anthony’s on Saturday at the third time of asking after Glenury Park passed a 7:30am pitch inspection. The Hive were first to threaten and Anderson was unlucky to see his shot come back off the post after 3 minutes. The visitors came agonisingly close to opening the scoring on 13 minutes when a ball to the edge of the area found Duncan who headed over Stark but off of the crossbar. Cormack came close a minute later for the Hive but could only send his header over the top. The opening goal wasn’t far off and it was the visitors who got it. An unnecessary free kick was conceded on the Hive left and O’Brien sent a free header past Stark to put the men from Govan into the lead. The lead was nearly doubled on 21 minutes when the ball was played down the Hive right but luckily the shot was dragged wide of goal. On 27 minutes The Hive came close when a Neal McTavish throw found Armstrong who turned and shot but Duncan was equal to it and gathered at the second attempt. Hive found themselves on level terms on 34 minutes. Pyper played the ball to Cormack who squared to WYNESS who made no mistake at the back post. The home side started the second half as they had ended the first and soon found themselves in front. With just over five minutes gone the ball was slipped through to WYNESS on the edge of the penalty area and he sidefooted past Duncan. The Hive lead was doubled on 63 minutes when a ball into St Anthony’s box was slipped to Pyper and his low cross fell to ARMSTRONG who made no mistake. Stark was called into action on 72 minutes when a dangerous looking free kick was conceded on the edge of the area but he produced a brilliant fingertip save to maintain his sides’ two goal cushion. The visitors had a chance two minutes later but The Hive defence did well to clear for a corner. The ball was lost in midfield on 81 minutes but the visitors could only fire wide of target. With five minutes left another effort from distance deflected off of Adesola and Stark gathered. St Anthony’s had the final chance of the game and were unlucky to see the ball come back off the post and the grateful Stark gathered the loose ball.